Patty Lou FLANERY was born on 31 Oct 1925 in Neosho, Newton, Missouri. She died on 30 Jan 2009 in Seneca, Newton, Missouri. i. Robert T (Thom) PFLUG. Patty Lou Pflug, 83, Seneca, MO, passed into eternal rest January 30, 2009 at the Seneca House Nursing Home after a long illness. Patty Lou Flanery was born October 31, 1925 in Joplin, MO the daughter of James Martin and Opal Bamy "Patty" Flanery. She had worked for the Joplin R-8 School District in the Audio-Visual Department and was a member Seneca TOPS and a Past Worthy Matriarch of the White Shrine. Patty Lou married Robert Gene Pflug 1944 and he preceded her in death in 1992. 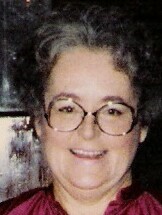 Also preceding her in death was her son Robert "Thom" Pflug in 2005 and her brother, James M Flanery in 1987.